Unexpected accidents can change your travel plans. Breaking a leg on a flight to London. I am a great believer in destiny. There are many events beyond our control that determine whether we live or die. Some years ago, I saw a picture of a Mercedes-Benz that had been pinned to the asphalt by a steel beam that had fallen from a construction crane in Washington, D.C. The driver escaped unscathed because the beam penetrated the car through the roof and the unoccupied rear seat. Another memorable story was that of a driver going to work on I-270 while a truck on the 495 beltway failed to maneuver a turn on an overpass and spilled its cargo of lumber, killing the driver below. One second earlier or one second later the outcome might have been different. Sometimes these random events that we call destiny do not determine life and death, but they may alter just a few days of our life or the rest of our life for better or worse. An older couple in my building had been planning a vacation to England for many months to visit the wife's brother who had not been in good health. Their transatlantic flight from Washington, D.C. had the usual delays associated with increased airport security, but it was fairly uneventful until dinner was served on the plane. He ordered meat and she ordered pasta. Maybe because of the jiggling of the plane or something in the food, she had an upset stomach and had an urge to vomit. She got up quickly to go to the bathroom, and once inside the bathroom she passed out and fell. When she regained consciousness, she realized that she had hurt a leg during the fall. The pain was tremendous. The flight attendants suspected that she probably had a broken leg, but unfortunately, there were no doctors on the flight. She was moved to the first class section and her chair was reclined to elevate the leg slightly. She had to endure the pain without treatment for two hours until the airplane landed in London. She was taken immediately to the hospital. In the meantime, her relatives started to worry because the plane had arrived and there was no sign of the couple. Finally, after some inquiries, they found out what had happened and headed for the hospital. The lady was confined to the hospital and her husband and her family spent the next several days coming and going to the hospital instead of taking the sight-seeing tours that they had planned for so long. 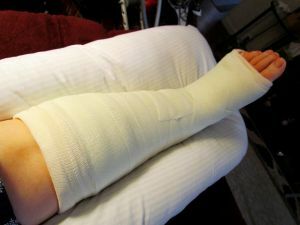 The lady's condition was serious enough that she had to have an operation to join her broken bones with screws, and a cast was put on her leg. Finally, after a week of this ordeal, the couple returned to the United States, but the fun was not over. Coming back, they found out that they could not enter the United States without having customs take off the cast to make sure that whatever was inside the cast did not pose some kind of terrorism threat! The cast was sawed off, and after inspection, the cast was put back together with duct tape. Fortunately nobody died, but situations like this make you realize how our life, our health, and our happiness sometimes depend more on external events than on our own actions.